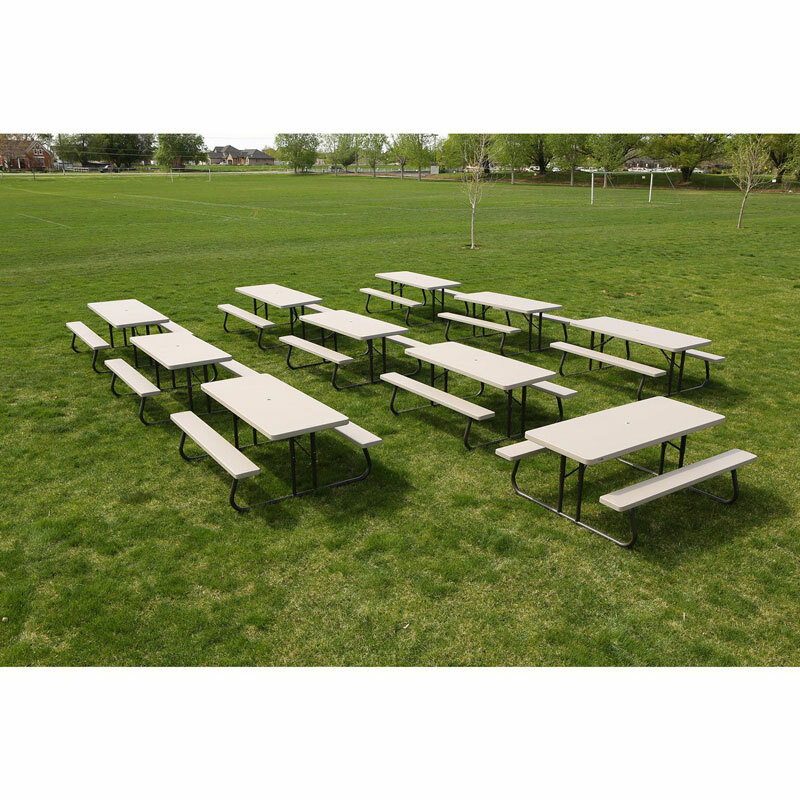 Product: 2119 10 PACK (FREE SHIPPING) Lifetime 6 ft Picnic Table with a 72 x 30 Putty Colored Molded Top, 1-5 8 Round Bronze Hammer Tone Folding Frame, wider top (30) Replaced model 2160 Lifetime Tables. If you only need one check out 22119 Lifetime Picnic Table. 6 ft. table generally seats 6 adults comfortably. Picnic Tables Plastic Top is Umbrella Hole Ready. 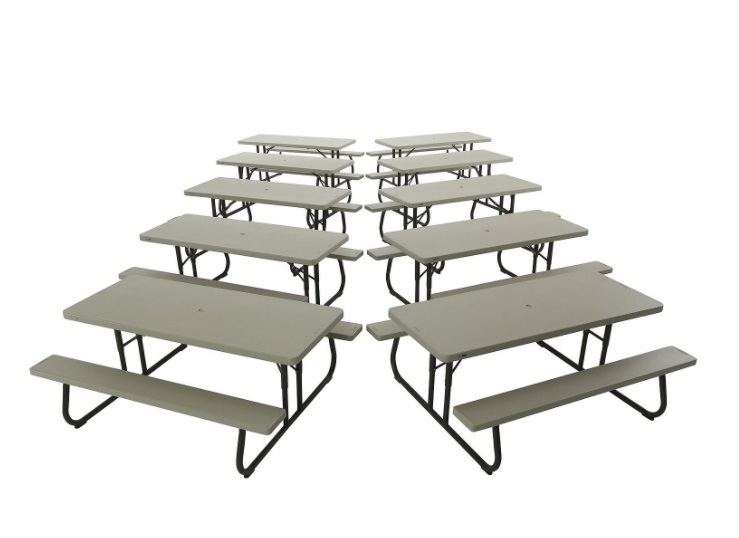 See our entire line of Lifetime picnic tables. 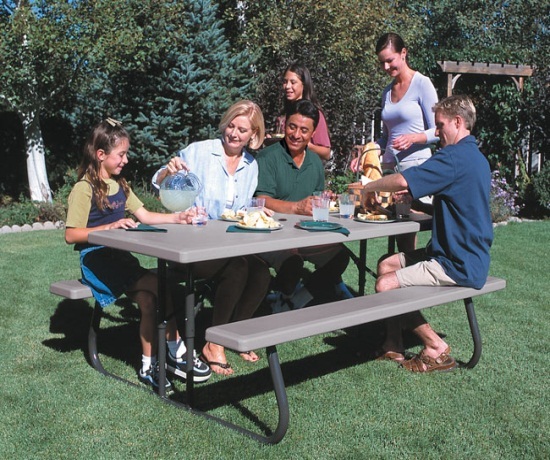 The most common customer for these tables are campgrounds, churches, and schools. While these are great for home personal use, they also have the quality to be used in more frequented areas. 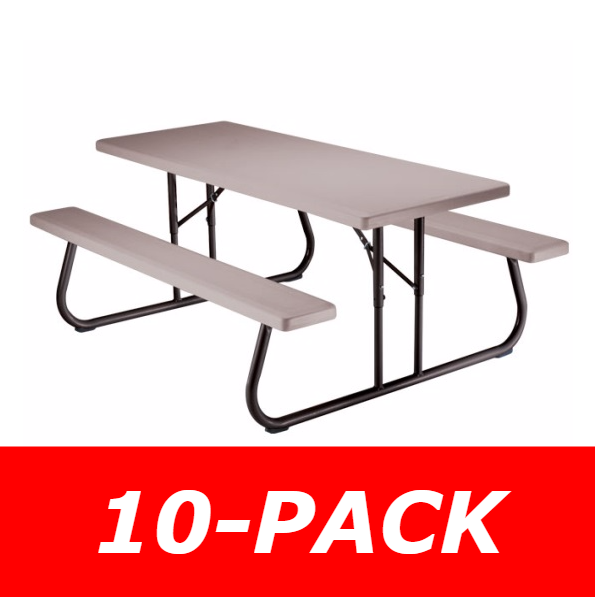 Lifetime folding picnic tables are easily collapsible and transported. Transportation is usually best accomplished by two able-bodied adults. Transportation by vehicle can be a little tricky. These picnic tables are generally too wide to fit inside most vehicles, even SUV's. 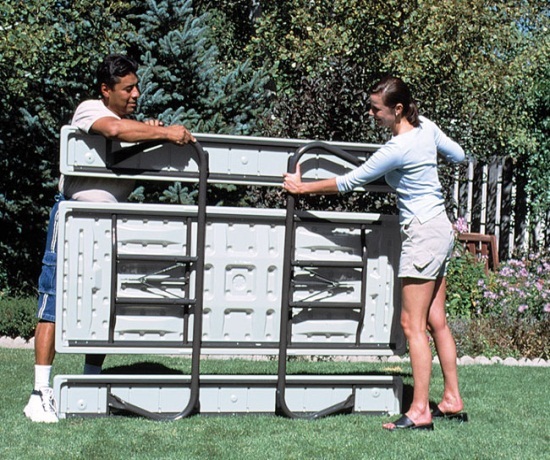 Make sure you measure the width of your intended storage vehicle before purchasing the picnic table. 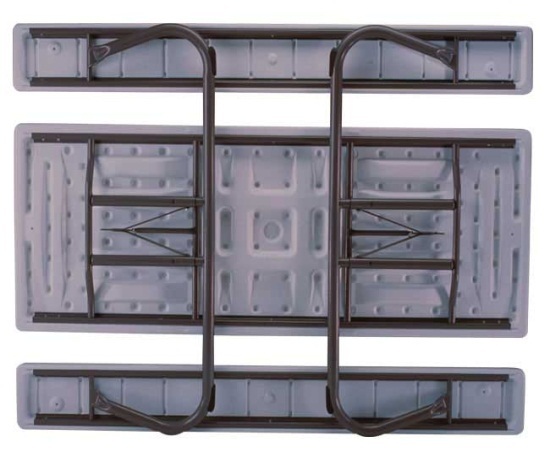 Typically, most truck beds can easily fit this table, though sometimes you cannot lay the table flat. Fast shipping, excellent packaging, and a great, durable picnic table sure to outlast any wood table. We have been buying these tables for years. They look good and serve the purpose for us but they do not hold up well. The edges of the table top and seats split and become sharp edged. I would be happy if I could replace the top and seats for a reasonable price but a replacement top and two seats is more than an entire new table. I wish they would make the plastic thicker at the edges so the tables would last longer. I come from a family of seven children. We all now are grandparents. Lots of people at family gatherings! About 20 years ago we bought this product to help with seating and eating at family gatherings. Everyone loved it so we soon purchased another. Then members of the family started buying their own. Several years ago my wife and I purchased two tables for our own growing family gatherings. The best part is that with reasonable care these table will indeed last a Lifetime. I fully plan on being able to pass our 2 tables to our children when my wife and I leave for the great Family Gathering in the sky! Pros:Good Surface Area,Attractive Design,Sturdy,Nice Finish,Good Height Best Uses:Gifts,Informal Dining Describe Yourself:Midrange Shopper Bottom Line:Yes, I would recommend this to a friend. I purchased one of these tables for my elderly mother. She lives in public housing, and many of her neighbors are disabled with walkers or wheelchairs. She and her neighbors love this table. They can easily maneuver up to the table, and gather there in the evenings during the summer months. During harsh weather, it held over 3-feet of snow for weeks and was unaffected. She's had it for several years, and it has been exposed to the elements the entire time. All she does is wash it off with soap and water. We couldn't be happier. We now have 80 of these picnic tables in our Turtle Kraal RV Park in Alton, NH. They are perfect for our use on every site occupied. They fold easily for winter storage. They are sturdy and tolerate the weather elements. There is an umbrella hole. We transport them in the back of an All Terrain Vehicle. we will be purchasing more! This table is weather resistant and can be folded up and stored along a wall out of the way. 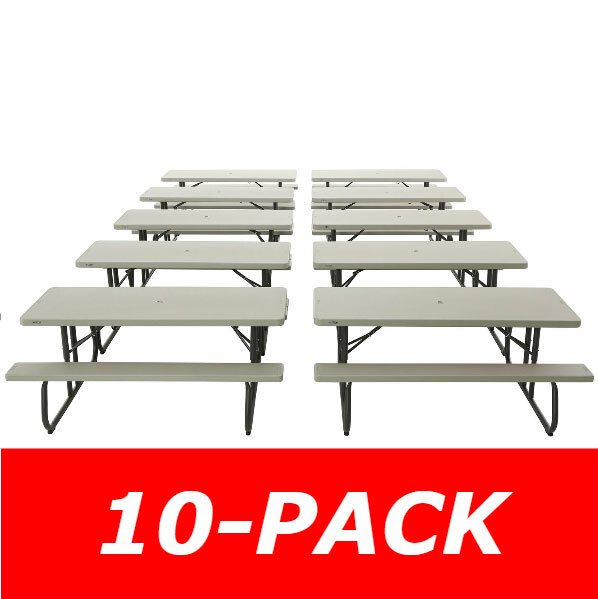 Q: If I order 1 package of 10 folding outdoor picnic tables, is it shipping free? A: Shipping is free on this item. Most of our items have free shipping, and all orders over $15,000 get free shipping. Q: How many tables are included? A: This is a full pallet and includes ten tables. Q: Do these come pre assembled? A: They come unassembled, but assembly is very easily. It takes maybe ten minutes for the first table and then each additional table is pretty quick. The frame is pre assembled for the most part and you simply attach the tabletop and benches to that frame. If you have a drill you are set. Shipping: Orders for the 2119 10-Pack Lifetime Tables generally leave the warehouse the next business day. Dimensions: 73" x 31" x 45"